Home » How? 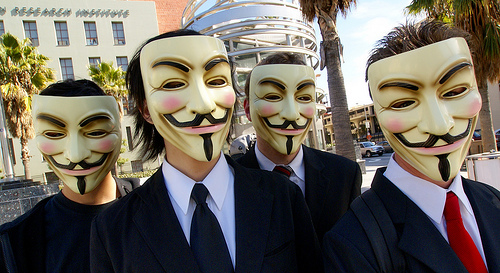 » How to be Anonymous without breaking laws? Just to make it pretty clear: To be part of Anonymous has nothing to do with breaking the current laws or neither is against any particular interest. Anonymous is any person that is raising awareness toward the need of a new society that actually questions authority in an intelligible and respectful manner. For example, Creative Commons or Open Source is part of this awakening of consciounessnes that is now being labeled as Anonymous. 01If you are a creator, use an open licence with everything you create. You choose how free, what type of licence, but make it free as in freedom to distribute. 02 Allow people to donate although you might also sell your work. Some might offer a smaller amount to demonstrate their support because they might not be able to afford your established price tag. 03 If you are a person working in a factory or corporation, be creative. Express your individuality in places they seek to have a mono-system of being. 04 Be loving, calm, kind, and assertive toward those who are rude and even aggressive toward you. Never return aggression with your anger, instead walk away with peace of mind. Ask: Does violence come from fear? 05Ask and expect accountability toward those who are currently in the structures of power. 06Challenge the traditional ways of doing things. Do not fall into the peer pressure of doing things. If you feel it is not right, say NO! 07 Keep asking questions. Never accept a shallow answer. Keep digging until you realize what is the truth, and what is an interpretation or a method of propaganda to make you believe in something that is not real. 08 Study and change the laws through political activism. Laws are a living entity, not a static book to follow. Be stronger that lobbyists. Protest! Insist with your voice that one is not surrendering to those who seem to believe have power. Remember: They are powerless without you. Ask deeply: What is fear? Where does fear lie within you? What is the role of fear? Why do people use fear to control? Are there good types of fear? How far does fear go? What is the function of fear? Can we completely remove fear from our inner self? How? Anonymous is evolving because as each person that realizes he or she is part of Anonymous, it changes. Each person uses their own knowledge and perception of the truth to change the currents of thought within reality. Therefore, Anonymous is something that cannot be imprisioned. It is a global consciousness awakening to the fact that we are everyone, and everyone is Anonymous. One cannot stop an awakening of consciousness. One cannot stop unity. One cannot stop Anonymous. One cannot stop YOU.